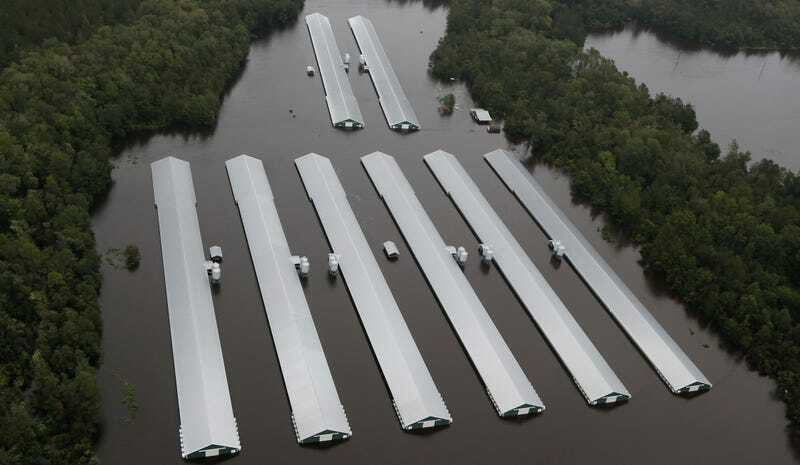 Chicken farm buildings are inundated with floodwater from Hurricane Florence near Trenton, North Carolina. Large parts of the Carolinas remain underwater thanks to Florence’s record rainfall, but the impacts of the storm are slowly trickling out. The latest news from the state’s flooded agriculture sector is not good. As of Monday, 1.7 million chickens had drowned in the rising waters, according to a release from Sanderson Farms, one of the largest poultry producers in the state. That represents about 8.5 percent of the 20 million chickens under the company’s purview. The company warned some 6.3 million more chickens are at risk as floodwater acts like a moat, cutting off farmers from the industrial feed lots. Without access, those chickens could drown or starve to death. If nothing, it’s a reminder of the insane scale of commercial meat operations. Concentrated animal feeding operation is the industry lingo for these farms, and it’s an apt one. The at-risk chickens live on just 30 farms, each of which houses an average of 211,000 chickens. All those chickens help feed the world’s voracious appetite for the birds. Chicken is the most consumed meat in the U.S. according to U.S. Department of Agriculture data. The agency’s latest monthly analysis also shows that chicken is the biggest U.S. meat export. It’s just another horrific impact of Florence as water drains (extremely) slowly from the landscape. We’ve also seen flooded highways and at least one toxic coal ash spill caused by Florence’s rains. The Associated Press also reports that 5 million gallons of partially treated human sewage have spilled into the Cape Fear River. Then there are the pig poop lagoons, which were a big concern before Florence. The North Carolina Pork Council said in an update on Tuesday afternoon that there’s only been one lagoon breach, but that three more lagoons have been damaged and nearly two dozen have been overtopped or inundated. As Emily Atkin at the New Republic notes, our increasing love of pork has also helped these 2,000 farms stay in business. Earther has reached out for additional information on fate of the animals on these low lying farms and we’ll update this post if we hear back. All of this means that the direct human toll of Florence—official estimates put it at at least 33 deaths, a number that will almost certainly rise—will be supplemented by a host of indirect impacts as the storm’s toxic legacy becomes clearer. It’s a story we’ve seen play out before from Houston to Puerto Rico, this time with a chicken-corpse laden twist. Update 9/18/18 10:15 a.m. ET: The North Carolina Department of Agriculture and Consumer Services has put out an estimate the 3.4 million chickens and turkeys have died as well as at least 5,000 hogs. A department spokesperson told Earther that number will likely change (and I’m guessing it’ll go up) as recovery efforts progress but there’s no timeline for when we can expect a revised count.